beaTunes 4.0.13 is out and it's not just fixes. Even though it's only a point release, it offers a couple of new things I hope you're going to like. The feature included in this release, that was demanded most, is most certainly prefix search. That's the kind of search, where typing the first couple of letters of a word already leads to matches, with no need to type the entire word. 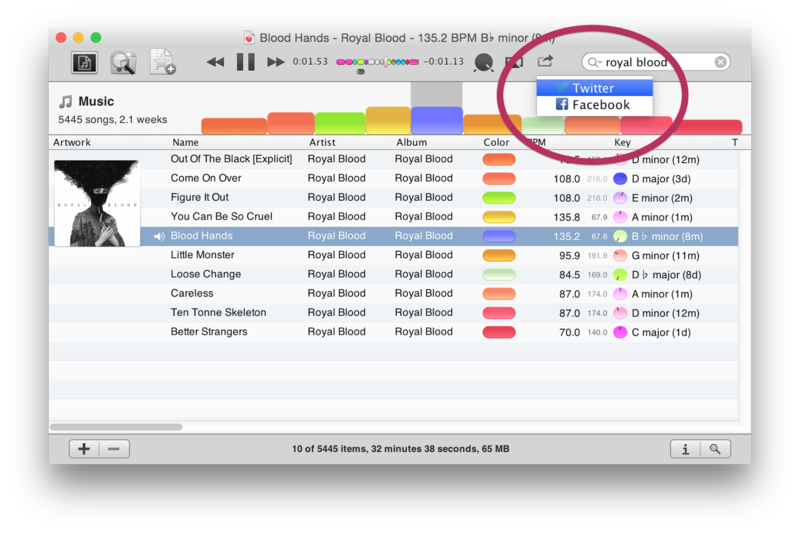 Another new feature is the Share button. Located to the right of the volume knob, it allows you to tweet what you are listening to, conveniently marked with the #NowPlaying hash tag. On OS X 10.8 or later, beaTunes uses the system integration, on 10.7 and Windows it simply opens a browser window. In either case you can edit what you post, before it's published. Last but not least, beaTunes 4.0.13 features a new Open in... context menu: Chordify, which lets find out the chords of any song in your collection that's also on YouTube, Deezer or Soundcloud. Just right-click on a song, choose Open in... > Chordify and watch the chords appear in your browser. If you like to play guitar, Chordify is a website you must know. I'll write more about it in another post. There are a couple of other things fixed and new, which I don't want to go into in great detail. Please simply refer to the list below. Fixed translate button in Get Info lyrics pane. Fixed issues with Apple Lossless on Windows. Added new read-only file inspector. Improved file system based sync speed. Improved multi item Get Info panel. Split visible column popup into sub-menus. Allow importing of zero Last.fm tags.